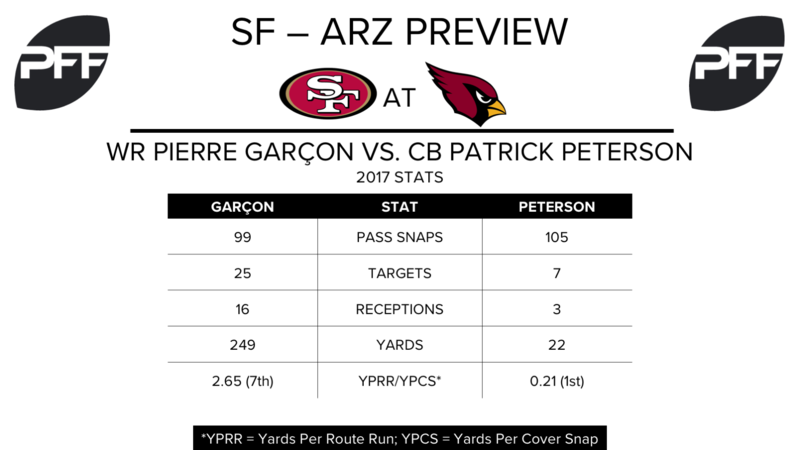 WR Pierre Garçon vs. CB Patrick Peterson — Garçon shredded Trumaine Johnson on Thursday Night Football last week, hauling in 7-of-10 targets for 142 yards in total, five receptions and 133 yards of which came against Johnson’s coverage. San Francisco’s top wideout is averaging 2.65 yards per route run on the season (seventh) and his 85.1 overall grade ranks sixth out of 106 qualifying wide receivers on the season. Garçon will spend the day battling against one of the league’s top cornerbacks on Sunday in Patrick Peterson, who will shadow Garçon all over the field. Peterson has been superb in coverage this season, ranking first in cover snaps per reception allowed (35.0), yards per cover snap allowed (0.21), and cover snaps per target (15.0). QB Brian Hoyer vs. Cardinals’ blitz — Arizona has consistently been among the league leaders in blitz rate in recent seasons, but have been uncharacteristically cautious bringing extra rushers through three games. After blitzing on 40.9 percent of passes in 2016, they’re down to 28.6 percent (15th) this season despite generating pressure on an impressive 53.3 percent of those blitzes (sixth). This week presents as good of an opportunity as any to turn up the heat. On 46 blitzed dropbacks, Brian Hoyer has the league’s fourth-worst passer rating (65.9) and is averaging a poor 4.8 yards per attempt. T Joe Staley vs. EDGE Chandler Jones — After struggling on the road against the Seahawks in Week 2, Staley bounced back in a big way last week. Staley’s 89.8 overall grade landed him on the PFF Team of the Week, doing good work in the run game and shutting down Robert Quinn on his way to a clean sheet in pass protection. The veteran left tackle will face another quality pass-rusher this week in Chandler Jones, whose 82.9 overall grade currently ranks 16th out of 97 qualifying edge defenders. Jones rushes the passer almost exclusively from the defense’s right side (96.8 percent on the season), and his four right-side sacks trails only former teammate Calais Campbell on the season. C A.Q. 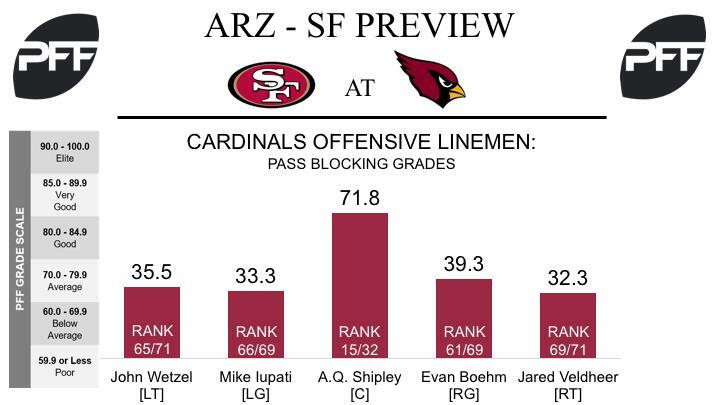 Shipley vs. DI DeForest Buckner –As a unit, the Cardinals offensive line has drastically underperformed so far this season, and collectively they rank 31st in the league with a pass-blocking efficiency of just 66.8. Center A.Q. Shipley has arguably been the unit’s best performer in pass protection this year, having allowed just five pressures on 144 pass-blocking snaps on the way to a pass-blocking grade of 71.8, the best mark among all Arizona’s linemen. He’ll be in for a tough matchup against interior lineman Deforest Bucker, who is making an impact in the Niners’ pass-rush this season. Through three games, Buckner has tallied more pressures (16) than any other interior lineman, and is currently ranked third among players at the position with a pass-rush grade of 85.7. TE Jermaine Gresham vs. LB Ray-Ray Armstrong – Despite being limited for most of practice last week, Gresham played 55 of 81 offensive snaps in his team’s Week 3 contest against the Dallas Cowboys. The eighth-year tight end caught five of six catchable targets and averaged 1.57 yards per route run, the tenth highest mark among tight ends. He can look to build upon his performance by taking advantage of his matchup against Armstrong, who is currently filling in for the injured Reuben Foster. Through three games, Armstrong has been quite shaky in coverage, allowing a passer rating of 132.3 and an average of 1.70 yards per coverage snap. WR Larry Fitzgerald vs. CB K’Waun Williams – The ageless receiver’s masterful performance against the Cowboys last Week earned a PFF overall grade of 86.7, the tenth-highest overall grade among receivers. He caught all 13 of his catchable targets for 149 yards, with 44 of those yards coming after the catch. He did most of his damage from the slot, where he played 64.8 percent of his snaps and averaged 2.07 yards per route run, the seventh best mark among receivers. On Sunday, he’ll be going against Niners’ cornerback K’Waun Williams, who was recently signed to a three-year extension. Through three games of the 2017 season, Williams has surrendered a passer rating of just 88.0 on throws into his slot coverage, the 19th best mark among cornerbacks.